We’re talking Pro-Level quality here. Lang’s Hybrid Smoker Cooker is a solid 1/4” thick pipe with a separation wall that’s welded between the grill and smoke box. This hybrid offers Lang’s competitive quality and features the famed reverse flow system and offset smoker. The firebox goes 17” x 17” along the right side, and there’s a double rack charcoal grill extension on the left. 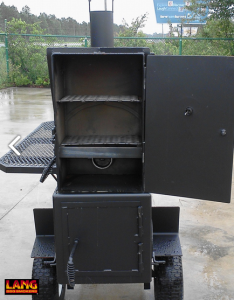 This Lang Hybrid Smoker Cooker provides a family size competition quality ¼” pit with two 18.5” x 15” bottom racks. There’s a 23.5 x 16” sliding upper rack that will hold an amazing, 60 to 72 pounds of meat, and there will be plenty of room to spare. All the grates are expanded metal and reinforced with square tubing frames. Lang has engineered a smoker cooker that will for generation (you might consider that when you write your will). The old adage is continually proven true: you get what you pay for. And with Lang’s Hybrid you’re sure to get more than you pay for not only in quality but all those memories you’ll create smoking for friend and family. The smoker side is engineered with Lang’s incredibly efficient reverse flow design which provides more even air flow and heat flow than typical offsets that have a firebox to one side and chimney on the other. Reverse Flow smokers place the chimney directly above the firebox, so heat travels along the bottom of the cook tank to the opposite side where it flows upward then reverses course and moves back to where started and then out the chimney. There’s an optional warmer box, shown in the photo above. The Lang Hybrid Patio is also available in a 48” model that you can trailer mount. As with every smoker Lang develops, every detail is well and carefully thought out. View more info about the patio hybrid models.